"It's a David and Goliath battle," Cwodzinski said. David's allies, however, are flexing some muscle in this fight. Three DFL mail pieces promoting Cwodzinski have already gone out in the district, which is earlier than in past campaigns there. Two allied groups are also getting involved: Planned Parenthood has sent mail into the district and the Alliance for a Better Minnesota has started running a television ad touting Cwodzinski. Cwodzinski is also getting help from a network of former students as they knock on doors across the district. Even though Hann said he doesn't sense a real threat in his bid for a fifth Senate term, he is devoting plenty of effort to his race anyway. Senate Majority Leader Tom Bakk, DFL-Cook, said he doesn't relish coming after Hann. "For a moment I think, 'Well gee, I think David Hann has been very good to work with as a leader. He never takes anything personal.' So it just isn't personal between he and I," Bakk said. "It's just that his district is changing and we have a very good candidate interested in the area." Hann won his last race by a little more than two percentage points in 2012. He prevailed even as Democrat Barack Obama narrowly carried the Senate district in the presidential race. Still, history proves that defeating a caucus leader is far easier said than done. If Hann is defeated, it would be only the fourth time in more than a century that the leader of a legislative caucus was ousted by voters, according to joint research by MPR News and the Legislative Reference Library. The last one was DFL Senate Majority Leader Dean Johnson, who lost in his 2006 campaign. Johnson said at first he saw the spirited challenge as an attempt to distract him from the bigger picture that year — until a late barrage from Republicans and their allies spelled his doom. "I think they wanted to occupy my time, made sure that I spent most of my time in Willmar, Minnesota, as opposed to Faribault County or Alexandria or other places where we had competitive races. No doubt about it," Johnson said. "But then they smelled the defeat." Johnson's advice? Don't neglect the home front. Hann said he's not. 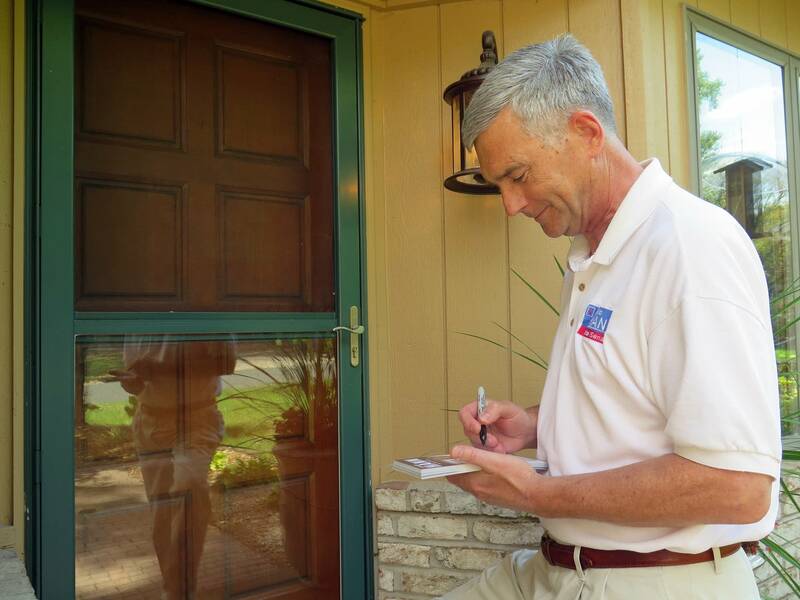 So far, the race is playing out mostly in the mailboxes and on the doorsteps across Eden Prairie and the small sections of Minnetonka and Hopkins that make up the Republican-leaning district. As the leaves come down, the lawn signs are going up and the rivals are making the rounds. On a recent afternoon, Hann went from one house to the next with a stack of postcards that list his priorities as improving education, overhauling the MNsure health insurance exchange and lowering taxes. Most people weren't home, but Hann encountered Glen Feyereisn, who said he voted for Hann before and will again. He urged Hann to do something to lower the cost of vehicle registration. Then Hann fished for Feyereisn's view toward the disputed Southwest Corridor light rail project that would start in downtown Minneapolis and end in Eden Prairie. "I'd like if it went in. I'd support it. Absolutely," Feyereisn responded. "'What's your position on it?'" "Well I'm trying to get them to have a hearing on it in the Legislature. I have concerns about how much it's going to cost and how much the property taxes are going to be affected by it," Hann said. "So I think there are some questions I'd like to know before I sign up for it. So I've been kind of skeptical from a cost-benefit tradeoff." In an interview, Hann said he's a believer in public transit, as long as it makes economic sense and provides enough flexibility to commuters. He said the suggestion that he's blocked it is mistaken. "There's never been a vote," Hann said. "I've never voted for or against Southwest light rail." Cwodzinksi supports the project and argued Hann's reluctance to embrace the light rail line speaks to something larger, noting how most local leaders are on board with the transit line. "I think Senator Hann has done a great job representing his caucus as Republican minority leader, but I think he's dropped the ball on representing his constituents," Cwodzinski said. He also brings up Hann's co-sponsorship of a 2012 amendment to ban gay marriage. The amendment was defeated in a statewide vote and lost resoundingly in Hann's district. Hann said "nobody has mentioned it at all" when he's been out campaigning. He stands by his position on the issue. 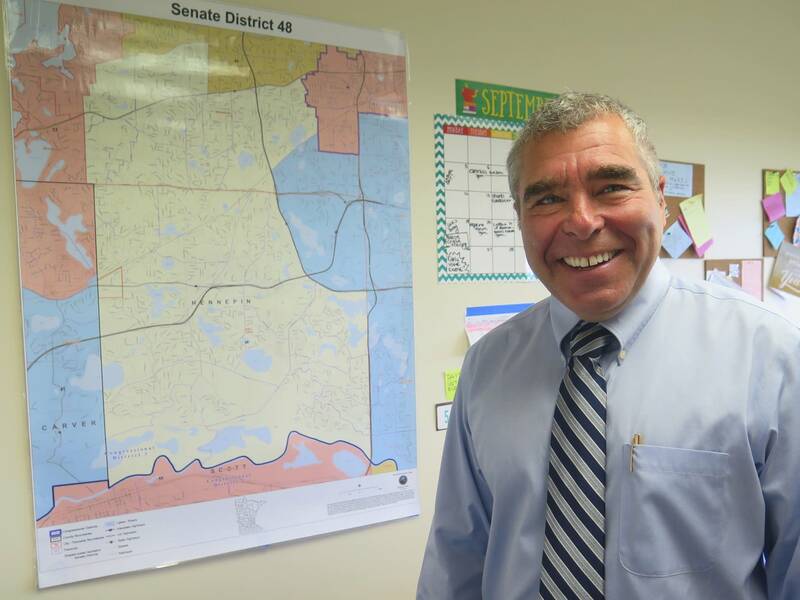 Cwodzinski moved into the district within the past year from nearby Chanhassen. Hann stresses how he's been a 33-year Eden Prairie resident and served for eight of those on the school board. But Cwodzinksi has a different kind of local connection. He taught for three decades at Eden Prairie High School. Hann said his son took Cwodzinski's American government course. "My sense is he was a good teacher and that he had a lot of kids that liked him and also had some kids that didn't really like him," Hann said. Before retiring this summer, Cwodzinski figures he taught 12,000 students, some of whom have helped him campaign. Around the neighborhood not far from the high school, Wendy Campbell paused during a recent morning to reflect on the race. She volunteered that four of her sons were in Cwodzinski's classes. She's a fan of his and intends to vote for him. "We need more people who are willing to at least listen and compromise. If we don't compromise, we aren't going to get things done," Campbell said. "And I think Steve can compromise." By targeting Hann, Democrats risk alienating a key Capitol player if he does return for next session — either in the minority or as the legislator in charge of the Senate. It's something Hann has pondered, too. "After the last election I was a little unhappy with Senator Bakk and the Democrat campaign, but I've never been one to bear grudges in this," Hann said. "I hope that whatever the outcome is, it will not be an impediment to relationships."